Irish potatoes in Musanze market. Kenya's eateries are reeling from an acute shortage of Irish potatoes with the Agriculture ministry putting the supply gap at 1.7 million metric tonnes. "In the next one year we are going to meet the deficit by ensuring that farmers use certified seed. 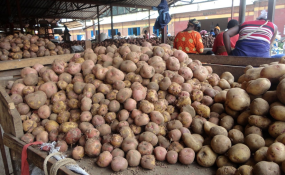 To date, the total production of seeds is at 6,700 metric tonnes short of the 30,000 metric tonnes required," he said. "The point of focus is on potato regulation, there are a number of things that are not okay and this has led to the exploitation of farmers by brokers," he said.